These are photographs of fruits at a market/shop in India. Fresh fruits are available in plenty in India. However they are often out of reach of the common man particularly fruit like Peaches, custard apples, pomegranates and plums. Raw Mangoes are used in cooking. Bananas and Guavas are the common man's fruit. 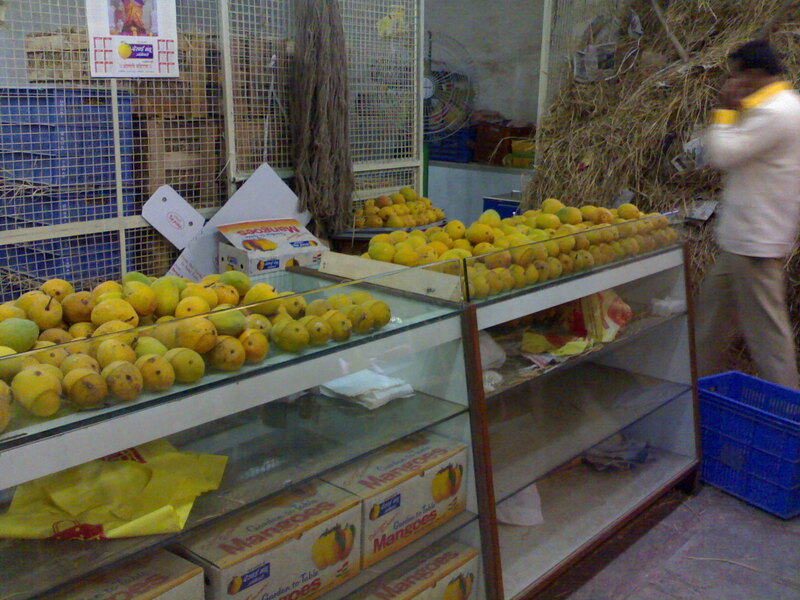 The next photo is of alphonso mangoes being sold in a shop in Pune. Mangoes are a favourite with Indians. The Alphonso mango (shown in the picture) is loved by people in Maharashtra. At one time Mangoes used to be available at reasonable prices but due to the popularity of the Alphonso Mango in foreign countries, the domestic prices have risen. The fruit is exported to many countries in Europe and the Middle East. Every year the price of Alphonso increases, with one mango often being sold for as high as Rs 50- 100 for a good quality mango. 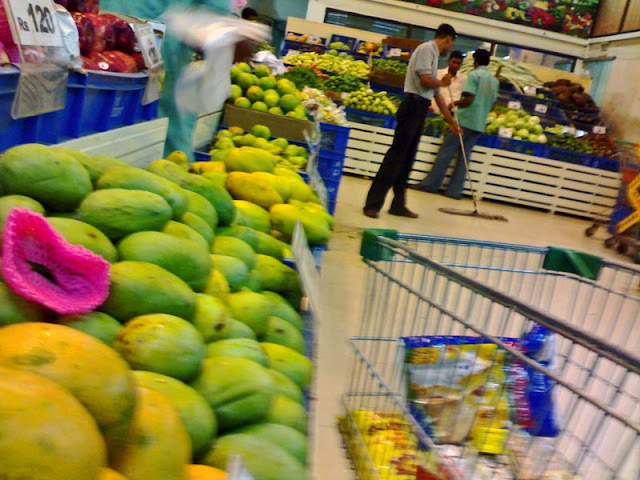 This last picture is of different varieties of mangoes displayed in a supermarket in the vegetable and fruit section. After April and May the season for Alphonso is more or less over and other varieties come in its place. The mangoes at the end of the pile, towards the middle of the picture, the long ones, are Dasheri mangoes, a fairly good variety of mango grown in the North of India.